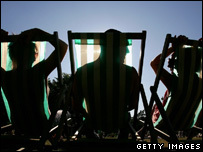 The world is likely to experience the warmest year on record in 2007, the UK's Met Office says. An extended warming period, resulting from an El Nino weather event in the Pacific Ocean, will probably push up global temperatures, experts forecast. They say there is a 60% chance that the average surface temperature will match or exceed the current record from 1998. The scientists also revealed that 2006 saw the highest average temperature in the UK since records began in 1914. The annual projection was compiled by the UK Met Office's Hadley Centre, in conjunction with the University of East Anglia. Chris Folland, head of the Hadley Centre's climate variability research, said the forecast was primarily based on two factors. The first was greenhouse gas emissions from human activity, he said. "This is a statistical method; it is a number that represents the heating of the atmosphere. "Greenhouse gases cause heating, while aerosols cause cooling," Professor Folland told BBC News. "The other factor which allows us to make a forecast that whether one year is significantly different from the next is the effect of the El Nino." El Nino events are marked by the arrival of unusually warm waters off the north-western coast of South America, and are described as the largest influence on the year-to-year variability of the Earth's climate. This year's potential to be a record breaker is linked to a moderate strength El Nino already established in the Pacific Ocean. The World Meteorological Organization (WMO) said that it was expected to continue into the first quarter of this year, which would have a knock-on effect. "There is a big lag between the El Nino and the warming of global temperatures - it takes about four months or perhaps a bit longer," Professor Folland explained. 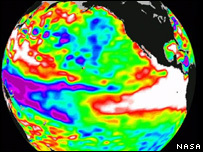 "We have two methods of forecasting the effect of the El Nino. One is a statistical method based on two patterns of sea surface temperatures in the El Nino region, and the other is a complex mathematical model." He said that the forecast was then fine-tuned by looking back over data from the previous 50 years. "We have actually run this forecast three times, updating it every month... and it is completely stable." Have you noticed changes in your environment? How has your world changed? The 60% probability that 2007 would set a new record meant that it "was more likely than not", he concluded. In December, the WMO released provisional data on the global average surface temperature for 2006. It estimated that last year was 0.42C (0.75F) above the 1961-1990 average, making it the sixth warmest on record. However, the UK experienced the warmest year on record in 2006, according to Met Office figures released alongside the global forecast. The meteorologists said the mean temperature for the year was 9.7C (49.5F), 1.1C (2F) above the long-term average, based on the period between 1971-2000.